Logitech Harmony Link | OhGizmo! Just last week, in my review of the Sony Tablet S, I was expressing my love of using a tablet as a universal remote, which is functionality it comes with standard. But that’s not the case with most other tablet and smartphones on the market. 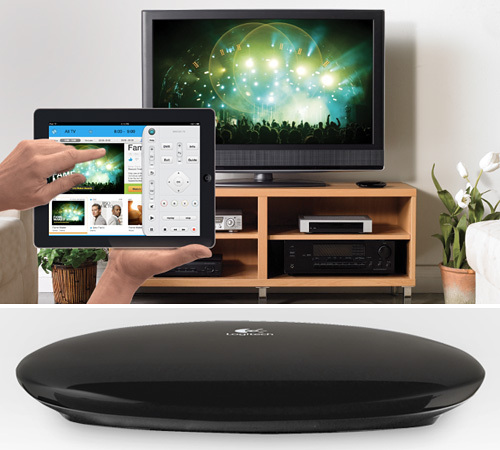 If you want to use them as a touchscreen remote, you either need a special case, or an external IR adapter. And Logitech, long known for their most excellent Harmony remotes, has gone that latter route with their new Harmony Link. The actual hardware doesn’t look that different from similar alternatives already available, but has the advantage of coming from Logitech who’ve had quite a few years to build up their databases of home theater gear and AV equipment. If you’ve ever used a Harmony remote, and have experienced how easy they can be to use and setup, you’ll understand why the Harmony Link is certainly an option you should consider. Available for iOS and even Android devices, the hardware works in conjunction with a free accompanying app that provides similar functionality to the company’s remotes. Except when it comes to the iPad, which takes advantage of the large display to provide interactive program guides and personalized listings. While some external remote adapters connect to the iPhone over Bluetooth, the Harmony Link connects to the wifi network in your home. So you’ll need to have your tablet or smartphone connected to wifi as well. It is a bit of an extra battery drain, but since all these devices are rechargeable, you won’t have to hunt for a fresh set of AA’s when the batteries die. Available come October for $99.99.